to the Locker Room Managers Association-LRMA-Home Page! The only web site on the Internet devoted exclusively to the issues, concerns and careers of Locker Room Managers in the United States and around the world. The LRMA was the brainchild of Todd Dufek, Shoe and Locker Room Services Manager at The Country Club at DC Ranch in Scottsdale, Arizona. Todd founded the LRMA in the spring of 1999 and is President of the Association. Todd's extensive professional experience is documented below. Todd Dufek was born in Sturgeon Bay, Wisconsin where his parents owned and operated a very successful shoe business (retail sales and repair) for 25 years. In 1969 his family moved to Lake Havasu City, Arizona, and set up a shoe repair shop that did a bustling business until it was sold in 1983. During high school and summers off from college and graduate school, Todd worked side by side with his father, accumulating over 10 years experience in all facets of shoe repair. After spending four years in the field of Behavioral Sciences, Todd returned to the shoe business in 1986. It was in April of that same year that he accepted the position of Shoe Steward at the Arizona Biltmore Country Club in Phoenix, Arizona. During his stint at the Biltmore, he was hired as a paid consultant by Reebok International's Golf Shoe Division. During a span of 10 years he helped Reebok develop their shoe care accessory line and as a scratch golfer, provided valuable feedback on the styling and function of their golf shoes. Articles on his rental golf shoe program and a review of THE GOOD STEWARD-How to Set Up and Operate a Shoe Room at a Country Club or Resort, have appeared in Golf Shop Operations Magazine and The Arizona Republic Newspaper respectively. He has written articles for and been published in Arizona Golfer Newspaper, Golf Magazine, Club Management Magazine, Golf Business Journal and is beginning his fourth year as a regular contributing writer to The Board Room magazine. He has also made appearances on KTAR radio's Tee Time Golf Show and on television's GOOD MORNING ARIZONA discussing various aspects of shoe care and golf shoe technology, including soft cleats. Todd is the CEO and founder of LRMA Consulting, a firm that does on site consulting/training at new and old courses alike, assisting with the design and set up of locker rooms as well as training shoe stewards in the fine art of locker room management and shoe care. Todd has done on site training and high-end clubs in Arizona, Colorado, California, Utah, Wyoming and Ohio and on the phone with clubs all over the country. Send him an email and request a schedule of his fees. Finally, he has assisted clubs all over the nation with finding the right personnel for their locker rooms, doing so via an association (see below) as well as the web site and monthly e-newsletter. During the off season and any other spare moment that he worked at the Arizona Biltmore Country Club he could be seen crouched over his laptop computer in his shop writing Christian literature or the latest edition of THE GOOD STEWARD. However, as of November 30, 1998, Todd was hired by The Country Club at DC Ranch, an exclusively private and opulent club in northeast Scottsdale, Arizona as Manager of Shoe and Locker Room Services. In the summer of 1999 he completed a companion book to the first STEWARD tome with the same title, but subtitled, How to Set Up and Manage the Locker Rooms at a Country Club or Resort. It is available for sale in the �Fore� Supply Company catalogue and can be ordered by calling �Fore� at 800-543-5430. Both books combined have sold over 500 copies to clubs in every region of the country and to facilities in Canada, Mexico and the Bahamas. At the time of this writing the locker room and shoe room versions are being sold by �Fore� for only $59.95 per copy. In the spring of 1999 Todd founded the Locker Room Managers Association. In the summer of 2000, Todd created the web site �www.yourlrma.com�, a home page on the internet for the exclusive use of those who manage shoe and locker rooms at country clubs and resorts worldwide. Articles on the web site have appeared in The Arizona Republic newspaper, Golf Business magazine as well as on numerous golf-related web sites. In 2002 the first club joined the organization and as of this writing there are about 80 member clubs in 30 states with 250-300 members participating. Click on the LRMA Membership link to join. In 2006 Todd wrote a 20+ page document entitled, �The Locker Room Managers Shoe Care System (LRMA Shoe Care System).� It concisely explains how to take care of any street and golf shoe no matter what its condition. In that same year he hired a production company and produced a 90+ minute instructional DVD (based on the written system) that was taped in his shoe room and contains 60+ minutes of hands on instruction. The written version of the system comes with every DVD and can be purchased for $99.95 through �Fore� Supply Company at 800-543-5430. (please purchase a copy soon as quantities are limited). Please note that close to 100 clubs across the country have purchased it with many giving it rave reviews. In 2008 Todd authored a third book on the profession entitled, �THE LOCKER ROOM MANAGER�S BOOK OF WISDOM- Information on Salaries, Shoe Care, Amenities, etc. 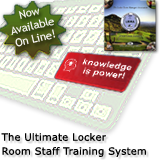 that No Locker Room Manager should be Without.� It is a collection of articles from the first four years of monthly e-newsletters and contains 200+ tips on every conceivable topic connected with the management and operation of locker and shoe rooms (including the only information on manager salaries to be found anywhere). It too can be purchased via �Fore Supply Company� for $59.95 or if your club becomes a member of the LRMA, your staff will be emailed the book for free. During the same year he completed a 10+ page article entitled, �The 10 Biggest Mistakes Locker Room Managers Make and How to Correct Them.� This article will be emailed free to any club or locker room manager that joins the association. Lastly, Todd wrote a series of snail mail newsletters for PrideSports that were sent out under the banner of the company�s own Softspikes Locker Room Association. Finally, Todd wrote and published a Christian allegory entitled, A CYPRESS TREE ODYSSEY- Making Sense of Trials and Tests On and Off the Course (Morgan James, 2007). This short but powerful book combines Christianity and golf in a unique format that can provide hope and strength to both the Christian and non-Christian. Anyone that would like to purchase a copy can go to the LRMA web site home page at www.yourlrma.com, scroll down until you see the red and black cover of the book on the right and click on the �Amazon.com� icon. From there you can purchase as many copies as you�d like. You can also visit the web site for the book at www.yourodyssey.net.